Written by Guest reviewer on Wednesday, 23 January 2019. 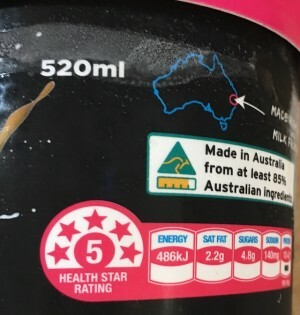 When surveying the ice cream freezer at the supermarket you don’t expect to see a Health Star Rating of 5 out of 5 on any products. All that cream and sugar! That’s why I was intrigued when I noticed that FroPro was proudly sporting 5 Health Stars! How can an ice cream get a 5 star rating? Great question and one I asked myself. FroPro claims the product was dreamt up by a professional athlete but doesn’t identify the said athlete. The claims on the pack include high protein, low fat, 95% sugar free, all natural, low GI, from 78 calories per serve, gluten free and - health halo overload – guilt free! FroPro is made in Australia from at least 85 per cent Australian ingredients. FroPro comes in four flavours. Each major supermarket — Coles and Woolworths — appear to each have one flavour that is exclusive to them (Toasted Coconut and Chocolate respectively) and then two others that are common to both (Salted Caramel and Peanut Butter). I have only tried the Salted Caramel variety. I found it pleasant tasting, although not really like a true salted caramel - not creamy and satisfying. The pack says a serve weighs 67 g and each pack contains five serves. This was an underestimate as we had good-sized helpings along with some fresh berries and found we got seven to eight serves per pack – more than five. This is not a ‘con’ of the product so much as of the website information. FroPro compares its products with three other ice creams by serving size. However, it doesn’t mention which flavour is being compared or how big in grams the serving sizes are. A comparison per 100g would have been more transparent. It’s expensive, at around $10 per 520ml tub! You can occasionally find it available on special for between $7.00 and $7.50. Yes. I’ve bought it several times when I want a bit of treat. In my book, however, it’s still a ‘sometimes' food. Note from Catherine: I bought a tub of the GreenTea and Mint flavour from a health food store. Must have been older or discontinued stock as it didn't sport the Stars as described above. Mine was not the same as a creamy ice cream; however it was refreshing on hot days.